Last week, through a series of events, an iPhone ended up on my desk. I was not planning on getting one, since I really liked my HTC s710 . 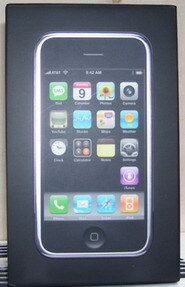 But if I hated the new phone, I could allways sell it on ebay and make a profit. The phone has a very nice design, everything just looks good. The box it comes in, the housing, the screen,… it just breathes quality. Now I’m not going to write an in detail review about it, but the most important improvement, if I compare it to my previous phone, is the web surfing. No longer is the layout of any site screwed up, you can zoom in and out on any site. Turn the phone on its side and you get a panoramic view, it’s just amazing, boom! This is significantly better than on the htc, but webmasters should still think about the footprint of their site on smartphones. I read the news on the mobile version of tweakers and while I could use their normal version, I still prefer the lighter one. It loads faster, has less graphical content,… just because the iPhone can display a full web page in all its glory doesn’t mean you can forget people are using other devices to visit your site. The Youtube integration is a cool feature as well. I was able to get youtube content on my htc with vTap, but no way near the sound and video quality I now have. Sending mail, nothing special here. Except ofcourse the touchscreen enables the nice scrolling feature which you have in all iPhone applications. There is integration with for instance, google mail, and you get imap integration if supported by the mail provider. But I just stick to the regular pop3. Music playback, the iPhone is an iPod so you get all of the features they have and more. Most notably is the coverflow which is a visual representation of your music albums. So instead of moving through the folders on the disk you get more of a real life experience of going through your cd collection. There is plenty more I could talk about but you’ll be able to find all of it on the internet, a good place to start is the Apple site. So what’s my advice on this new toy? Great device, it has a nice user interface, is more stable than my Windows Mobile device, doesn’t hang as much as the htc but it isn’t perfect. There are improvements that should be taken care of, for instance the keyboard doesn’t follow the rotation of your iPhone in all applications. Also I don’t think the device is for everyone, while I enjoy having my mails with me all the time and have the capability to go online everywhere anytime, I’m not Mr. everyday consumer. Most people will settle for a simple cell phone and MP3 player which you can both get for 1/4th of the price. But hey, don’t listen to me, you won’t regret having the device and the Apple marketing machine will probably do it’s best to convince you it’s the next best thing ;). 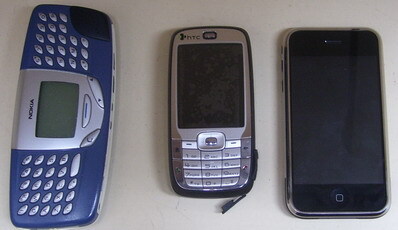 Below is a side by side comparison for the size.From left to right: a Nokia 5510, a HTC s710, an iPhone. There’s a screen protector with some air between it and the screen on the htc and some fingerprints on the iPhone 🙂 All can be removed easily.